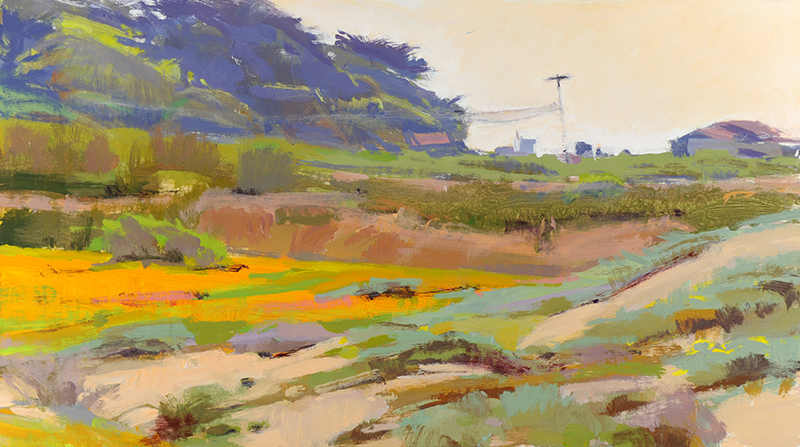 Mark Kerckhoff, “Farm Entrance at Aliso Beach, South Laguna,” oil, 16×20 in. Marcia Burtt Studio presents “Coastal Influence,” a group exhibition featuring gallery artists. Foggy mornings, June gloom, haze over the channel, coastal cliffs, palm and eucalyptus trees, sailboats beyond the breakers, and heat radiating off the sand are as much a part of our California summers as rocks, seaweed, and incoming waves. Marcia Burtt, “Sunday Morning,” acrylic, 10×18 in. Marilee Krause, “Wet Sand 2,” w/c&pastel, 9×10 in.